Knaphill is having a sermon series on Philippians. It was launched last week by a Local Preacher. Tomorrow, I get to preach the second sermon in the series. Each week is named after a song – hence this week’s title ‘Chain of Fools’. More strictly, this is about chains and fools. 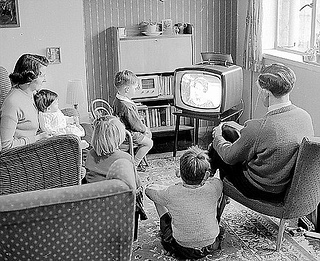 TV Shows We Used To Watch – Opportunity Knocks 1956-1978 by Paul Townsend on Flickr. Some rights reserved. People of a certain age will remember the TV talent show ‘Opportunity Knocks’ with Hughie Green telling us every week, “I mean that most sincerely, folks”. And anyone who has to remind you they are being sincere is automatically suspect to me. For that show, the opportunity that came knocking was for fame and perhaps fortune. It was the opportunity that a door would open into a wide vista where all things might be possible for those who won the public vote. For winners such as Freddie Starr, Paul Daniels, Les Dawson and many others, that was the outcome. But in our reading today the apostle Paul is telling us that opportunity knocks in a different way – not when the doors are flung open but when the doors are shut tightly, and chains are attached to his feet. Paul’s opportunity comes in prison. He is under the fiercest of constraints. And this morning I want us to explore what Paul tells us about the opportunities we still have as Christians when our lives are constrained. Our constraints may not be imprisonment, but they may be ill health, aging, unemployment, financial loss, bereavement, or any one of many unwelcome intruders into our lives. What kind of opportunities does Paul envisage us having? The Gospel has got into the imperial household, not by Paul hob-nobbing with the high and mighty, as if the only way to do so is by mixing with movers and shakers, but by his interaction with the soldiers guarding him. Not only that, his example in straitened circumstances has encouraged the local Christians ‘to proclaim the gospel without fear’. So find encouragement here if you think the only way the Gospel can prosper in society is if we in the church have connections with the high and mighty. Do not fear when you see the diminished public influence of the church, because the spread of the gospel is not dependent upon our level of influence in the media or government – much as I believe that it is important for Christians to be involved in both of those areas, creating stories and making policies that have their roots in the Christian faith. Do not be perturbed because you are one of society’s nobodies. The influence of the gospel doesn’t work like that. It goes from person to person as we let people see that Christ has changed us. And what could be more impactful than the fact that people see how our faith transforms our attitudes when we are down and struggling? It’s easy to say how wonderful Jesus is when times are good, when money is plentiful and when life is on the up. But when we can still speak of his love in those seasons where we are suffering loss or injustice, then we have a powerful testimony to God’s love in Christ for us and the world. It has been said that it is in the bad times that we know how much of God we have: I would say further that it is in the bad times that other people know how much of God we have. You see, the advance of the gospel in these isles doesn’t depend on the church supplying an unending list of celebrity testimonies, and it doesn’t depend on the Church of England retaining its Established status. The cause of the gospel in our land has more to do with ordinary Christians, even and especially those facing privation in their lives, commending Jesus Christ to people. The second area where constraints become opportunity for Paul is in the blessing of others who are not suffering. It’s one thing being chained into a life circumstance you don’t like and still finding a positive way to live for the gospel, but when people who should be colleagues and friends act not in co-operation but in competition, then liberal doses of sodium chloride are applied to an open wound. It may be that at work, someone takes advantage of your misfortune in order to further their career. It may be that in the church, someone you counted on as a friend discreetly puts you down to others behind your back, casting doubts about your suitability for something you are passionate about, and it all leads to them doing something in church life that you had longed to do – and they knew it. I pray thou shalt beget difficult teenagers, O thou offspring of a squashed cockroach! Behold, thou shalt have more mother-in-laws than King Solomon, thou relative of Herod! Woe unto thee, O thou Mesopotamian harlot, for you will go on a diet of crunchy, unsweetened locusts! But Paul doesn’t do that. Not only does he leave vengeance to God, rather along the lines of Psalm 35, which begins with the words, ‘Contend, O Lord, with those who contend with me,’ he does more. He rejoices in the successes of others. He just cares that even those who are preaching the gospel for the wrong motives are – well – preaching the gospel. This is a test of grace. Can we show that the gospel has been having an effect upon our lives in this area, too? We live in a culture whose building blocks include a large one called ‘envy’. Our economy is largely built on the idea that we must get bigger and better things, because other people have bigger and better toys. But can we rejoice that others have things we don’t? Another building block of our culture is called ‘status’. Can we be pleased for others who are elevated when we languish in obscurity? That young whippersnapper who came into the company after us, and who had the proverbial meteoric rise, shooting past us – can we rejoice in their success, and bless them? According to the gospel, our self-worth is not in our money and possessions and nor is it in our status. We are valued for far greater reasons: we are made in the image of God, we are redeemed by Christ, and we are being remade into God’s image by the Holy Spirit. These facts give us far more dignity than anything our society can offer. And if these things are central to our identity, we are free to bless others who enjoy the limelight while we are in the shadows. The third and final area where constraints become opportunities for Paul is in evaluating life and death. Again – remember Paul is in prison. His future is ambiguous. Will he be released, or will he be executed? That uncertainty would torture the minds and emotions of many. But not Paul. Again he sees something positive. He weighs up the pros and cons. If he lives, he can preach the gospel and encourage the Philippian Christians. If he dies, he gets to be with Christ – and nothing can better that. He regards his future as what we would call today ‘a win-win situation’. He simply can’t lose. Either he gets to do more useful kingdom work, or he goes to glory. Let me commend Paul’s positive outlook on the future to you. If life had been easier for him, I wonder whether he would have thought like this. But the chains of prison lead him to this faith-filled assessment of the situation that he just can’t lose, whatever happens to him. And as we dwell on Paul’s positive faith in the face of adversity, let me ask you again about the uninvited intruders in your life that have the potential to sow discouragement in you. For me, you will not be surprised to know that presently that means the traumas associated with my parents’ increasing frailty, and the major decisions my sister and I are suddenly faced with, far sooner than we expected. Can I live through this, believing in the God who works for God in all things for those who love him, or will I allow the crisis to drag me down? Can I believe that God can be glorified in my parents’ time of weakness and need? I think one reason why our trials stress us is that we forget to bring God into the evaluation. Without God, and without a hope that death is trumped by resurrection, all will seem futile. But when we factor in our Risen Lord Jesus Christ, things look different. They may still be painful, but they are transformed by him. Let me put the whole issue this way. If you set someone an assignment to complete in the creative arts, they may well produce their best work if you constrain their options. Ask someone to produce a painting, but limit the number of colours to be used. Invite a photographer to take pictures of an event, but only allow them one lens to use on their camera. These constrictions force new, creative thinking. 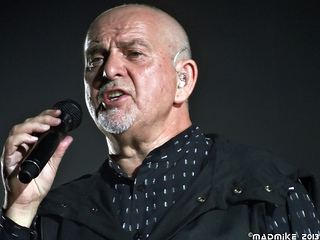 Peter Gabriel @ Forest National 2013 by MadmiKe.59 on Flickr. Some rights reserved. There is one famous example I can think of from the world of rock music. When the singer Peter Gabriel was making his third solo album, he invited his former Genesis band mate Phil Collins to play the drums on the tracks. But Gabriel told Collins he wasn’t allowed to play any cymbals. It contributed towards an unique and pioneering sound. Paul sets something similar before us here. His options have been limited. His best choices have been removed. And comparable things will happen to us as well. But the apostle rises to the challenge, and his faith in the crucified and risen Lord enables him to advance the gospel, to bless those of whom he might be jealous, and to see the most enormous kingdom possibilities in an uncertain future. I don’t mean to trivialise or minimise the woes in our lives. But I do hope we can take a lead from Paul in seeing that even when life is tough, we can find positive opportunities to live kingdom lives for the Gospel. Posted on October 12, 2013, in Sermons and tagged Freddie Starr, Genesis, Hughie Green, Les Dawson, Opportunity Knocks, Paul Daniels, Peter Gabriel, Phil Collins, Philippians, Ship Of Fools. Bookmark the permalink. 1 Comment.